As much as I love sequins and bright colors there is something about natural earth tones that always attracts me. Olive green, taupe, and tan are staples in my closet. Also a staple in the spring is a lightweight jacket in case it cools down, but I found that using a button up for coverage does the trick too. I just throw it on over my dress, roll up the sleeves and tie it in a messy knot and I'm done. I like that it gives the illusion that I'm wearing a cute skirt--instant outfit change. Taylor, these pretty neutrals are gorgeous on you. I love that dress and that you knotted a shirt over it -- perfect with those adorable wooden platforms! Again, you look amazing, and so relaxed! Love the previous post about your office! I really like how you used your top instead of a jacket.. Loving your platforms!! u look so lovely taylor! I love the all outfit, & you look so goergous! I love the floral skirt!! It is perfect for spring!! You look so lovely, another great BB Dakota piece. Love everything. So romantic. Love the shoes the most. I love the bag and shoes. I have a similar skirt and will have to think of ways to wear it now that spring is finally coming. i love the cover up addition to the outfit and that floppy hat look so easy-breezy chic on you! I love how you used the shirt, ingenious! Those shoes are so adorbs. Great color. Sure I've mentioned before how gorgeous that clutch is....love it! nice dress, it really suits u!! I love all of the colors here! The neutrals look so pretty with your floral skirt. That bag is adorable too. You look great in natural earth tones. The two items from Lulu's are especially cute--the floral skirt and those sky high heels. I love that hat and the great earthy tones of these pictures! So lovely, you look so good! I thought you were in face, wearing a skirt! I love that idea. You look great. i love that spring skirt, and the clutch is so cute!! I love your floral skirt with the earth-toned top- so cute! Plus the bag is fabulous!! Your outfit has such a light an airy feel about it. One of my favourite outfits of yours! I adore the shirt, the hat and shoes especially. Blondes always looks so great in naturals/greens specifically. Loving this look...and BB Dakota collection has been SO adorable lately. the outfit and the setting are perfect together! I just recently discovered your blog, but your style is quickly becoming one of my faves! this is a great look! Taylor, I love today's outfit! I love when someone can wear earthy tones well. And your ruffle clutch is adorable! Officially in love with that clutch!! Have a great day, C.
This is exactly how we women should dress all the time! :o) So girly and beautiful!!!! I have a love for neutrals as well... unfortunately I feel like it takes over the colors in my wardrobe! But more importantly I LOVE THAT CLUTCH!!! I will definitely be following in your footprints and picking one up for my self! LOVE this outfit!! And it looks like such a beautiful spring day! Love your shirt and skirt! Love the pretty outfit today. Such a lovely springy pastoral outfit. I do the button-up with my shorts but haven't tried it with a dress. Great tip. I agree with you on earth tones...they are just so classic and can blend with any skin tone! You look darling and that clutch is just perfect for spring...flirty, fun, romantic and almost flower-like! Fun skirt too and you sure know how to rock a hat! So many shades of green to love! And the color of the month according to Kate Spade, too. You look fabulous, Taylor. Loving that flowy top! I am in love with this look. Thanks for the inspiration. So very perfect for Spring! you also picked the perfect setting. 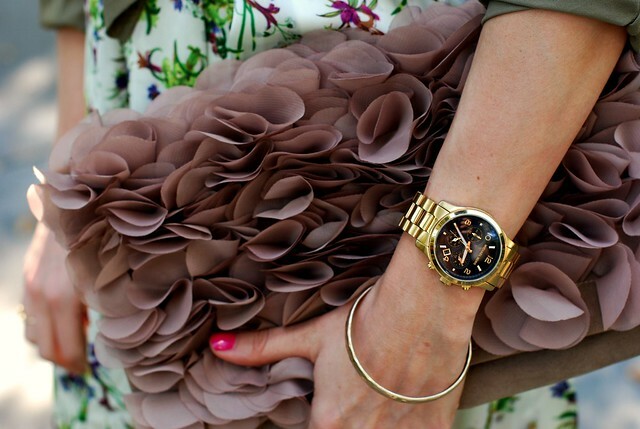 love the watch and the clutch. So cute! REALLY love that top, and your hat. Thanks for the springy inspiration! Thanks everyone! That clutch is one of my favorite things ever! I got it from Topshop a while back! You are too cute! I tried that hat on at American Apparel but didn't buy it. I might have to go back for it though! The colors are B-E-A-U-T-F-U-L! And I lovelove that clutch. Love the olive green on you! The clutch is awesome as well. The whole outfit is gorgeous but I love your hat. You look like you're all ready for a garden party - which is great! It's such a nice soft spring look. I'm usually all about the brights and patterns, but sometimes it's nice to do something soft too. The shoes are great. And they actually look comfortable! Would you say so? Olive green is one of my favorite colors and I just picked up a blouse in that color at J.Crew. Thanks for the outfit idea. I have the perfect dress (that I can wear as a skirt) with this shirt! All the florals are fantastic- the garden, clutch, and the skirt! Very springy! I totally agree! Neutrals seem to be so in right now. That clutch is gorgeous. Not to mention I love your floral skirt! Great idea about a button up in place of a cardigan or jacket! Love this whole outfit esp your skirt and purse! Love love love! I need to go to H&M and get that top! Love the clutch. I love the color combos in this outfit! You look so beautiful! Love those colors on you! Your shoes are amazing!! Great look. This outfit is perfection!! Taylor ... you are gorgeous!! XO! The color tones in this outfits are perfect!!! You look grande!! Such a girly/spring-y outfit! I love the fact that you tied a shirt over a dress! Great idea! Pretty Pretty Pretty!!!! I love it!!! Pretty clutch! You put together the loveliest spring outfits. Completely in love with that clutch. Absolutely darling and perfect for spring!! I love this look on you, green suits you. 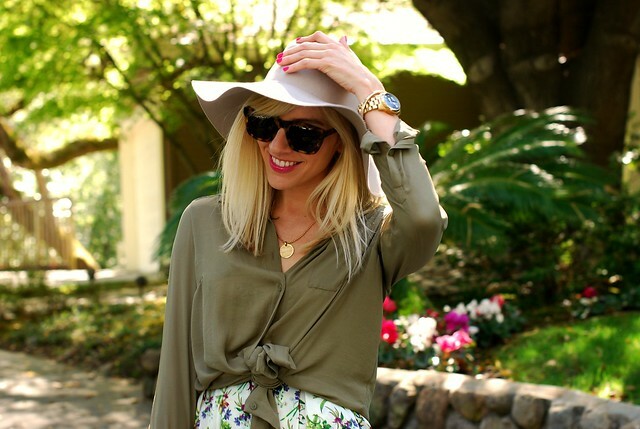 a floppy hat is so necessary for spring! !